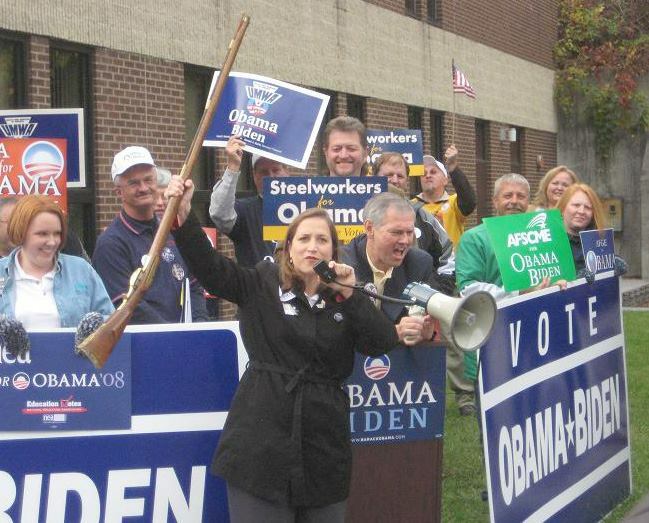 While Shelley Capito was standing up for West Virginia’s coal miners, some were standing up for Obama and Biden. We need Capito in the Senate. 21,000 men and women were directly employed by the industry and tens of thousands more worked in jobs created by the mining industry. In January 2009, Barack Obama was sworn in as the nation’s 44th president and he started his assault on the nation’s coal industry the very next day with the first objection letters filed by the EPA against mining permits. Today, just five years later, West Virginia will be lucky to produce 110 million tons of coal and more than 4000 coal miners are standing in the unemployment lines along with approximately 25,000 more West Virginians whose jobs depended on coal being mined. Unemployment rates across the coalfields are at 10 percent and getting worse every day, and this past week two more mines announced they would close and take over 400 more jobs with them. Just a few weeks ago, a group of local Democratic leaders went to Washington to try to discuss the issues with the new EPA. They came away believing it might be a new start but those ideas fell to the floor this past week when it became clear the EPA would announce new regulations that would effectively end the use of coal for electric generation. It is clear that the Obama Administration and the national Democratic Party care nothing for the hard working men and women who mine coal for a living. The coalfields are hurting but there is hope. However turning that hope into reality will require hard work on our parts. We have to survive the next three years. How do we do that? Sen. Joe Manchin has expressed his support for the legislation but Sen. Jay Rockefeller is apparently more interested in lecturing us about “embracing the future” than in actually protecting West Virginia’s coal jobs. Luckily, Rockefeller will retire after his term expires in 2014 and we have a chance to elect a pro-coal candidate who could shift control of the Senate from Obama and Reid. Rep. Shelley Capito is that candidate. She is the only choice for West Virginia’s coal families. Capito has proven herself to be a true friend of coal miners. In rally after rally and at hearing after hearing, Capito has been there, standing with us to defend our way of life. She founded the Congressional Coal Caucus, authoring and leading the passage of much of the pro-coal legislation that is sitting in the Senate. Electing Capito to the Senate could be the seat that takes away control of the Senate from Reid and his anti-coal, liberal allies, finally bringing an end to Obama’s war on coal. West Virginia cannot afford to hold on to the old ways of doing things. We can’t afford to vote for someone, no matter how much we may like them, who would hand control of the Senate back to Reid and Obama. It’s that simple. West Virginia needs Capito. We need a Senate who will fight against Obama’s pipe dream of renewable energy and refocus our national energy policy on proven, reliable and affordable energy sources. We have to put in place a Senate that is committed to restoring America’s basic industries and with it our economy and doing what is necessary to secure a future for our children. Obama simply doesn’t realize that without labor there is no capital and without jobs there will be no taxes paid. America needs jobs. We don’t need promises and pipe dreams. We need to get back to reality. The time for chasing fantasies is over. « You Can’t Have it Both Ways Joe!